@ iTunes, Spotify, Google ua si, Amazon thiab lwm yam. Freethinkers, Dreamchasers, Txoj kev ywj pheej Neeg nyiam heev thiab Misfit Mindz ... cia li sawv tsees!!! #3 nyob rau hauv Nyiv! 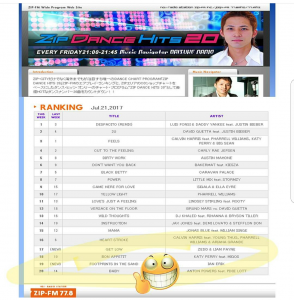 Ian’;s song, ";Footprints In The Sand”; has remained in Top 20 at Japanese dance radio all summer long since it debuted in June and this week has risen to #3! Look for the mashup of Ian Erix and David Guetta also hitting the airwaves in Japan this week! With his platform sneakers, multicolored cov plaub hau thiab trademark looj tsom iav dub, you won’t confuse Ian Erix with anybody else on the music scene right now. His outrageous style is a talking piece second only to his music which these days is perhaps best described as Electro Punk Pop. Cov me ntsis txog cov lub ua ntej tej hauj lwm hais tias ua ntej catapulted Erix mus rau hauv lub thoob ntiaj teb kev tsom teeb, racked up millions of plays online and landed him on several Top 10 charts rau 3 continents yuav yeej paub kos npe ntsiab ntawm nws lub suab, tiam sis lawv kuj yuav txaus siab rau tiag cov suab paj nruas evolution Erix tau undergone nyob rau hauv tus txheej txheem ntawm ua nws hotly xav tshiab cov ntaub ntawv "Quaj qw rau txoj kev ywj pheej" uas yog vim rau thoob ntiaj teb kev tso tawm nyob rau hauv caij nplooj ntoos hlav 2017. Erix ntxiv 17 hnub rau UK ncig saib! ©; 2019 Ian Erix: Raug raws ntaub ntawv Site. Tag nrho cov cai qhaib.